We invite you to utilize these free resources as you plan your construction project and select the architect with whom you want to work. Don't make these 5 common mistakes! Over my 25+ year career as an architect, I've seen many good people end up in EXPENSIVE messes because they make one or more of these 5 common mistakes when selecting an architect for their project. It's not your fault- there's so much misinformation out there! I want to make sure you have the RIGHT information so you can make informed, cost-effective decisions when selecting the architect for your project. That's why I created this FREE guide for you. 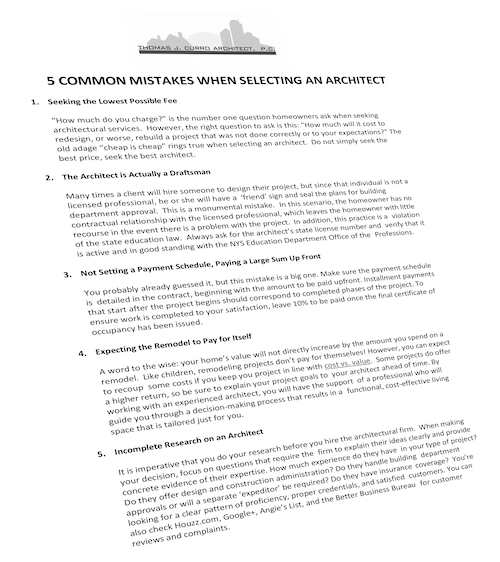 Click the button above to receive your copy of 5 Common Mistakes When Selecting an Architect and learn how to avoid making an error that will be costly to fix.